Small sterling silver shamrock earrings are enhanced with lab created emerald leaves. These cute sterling silver shamrock earrings feature lab created emerald leaves. 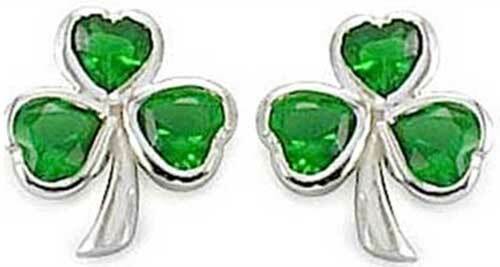 The shamrock stud earrings, with push on butterfly backs, measure 3/8” wide x 1/2" tall. These stud earrings are made by Cailin Jewelry in County Kildare, Ireland and are gift boxed with a shamrock history card, complements of The Irish Gift House. Shamrock necklace features sterling silver construction and is enhanced with lab created emerald leaves. Sterling silver shamrock necklace is enhanced by lab created emerald leaves along with a CZ stone border.